Working independently and effectively with money is a crucial component to independent living. 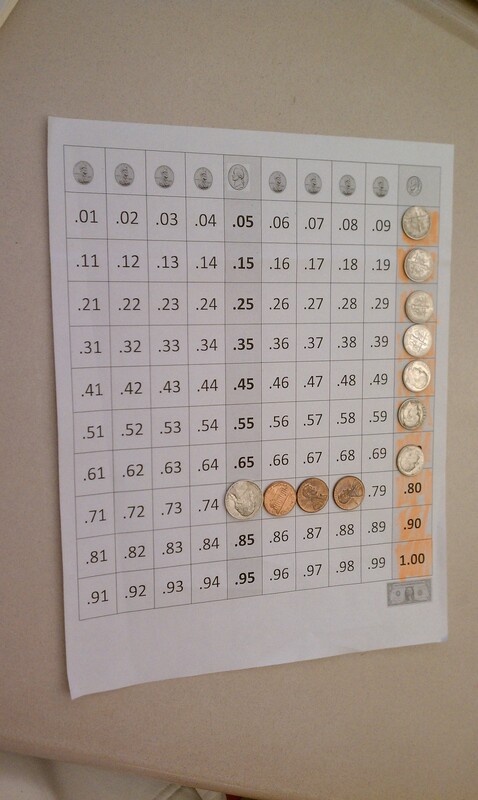 When I started working on math for students receiving special education I was taken aback by the number of high school students who could not work with money effectively, including counting out the total value for a given set of coins. One of the first situations I encountered involved an upperclassman who, as reported by the parent, was learning to count money by completing handouts at school. This is NOT the way to learn to handle money. Worksheets can be used to target a specific individual skill but to learn to handle money the student has to actually handle real money. This can take the form of baby steps – learn to crawl before walking. If a student has limited money skills here is one way to get started. Have the student simply hand money or a card to a clerk (see photo below). This can be done while you are shopping and the student only hands over money and receives the money. Pick a single item that costs a couple of dollars (and some change). Hand the student an appropriate number of bills (no change yet). Have the student count out the bills for a total and hand it over to the cashier. If necessary, have the student count out the money at a table or empty aisle in the grocery store then take the money over to pay. Then the student receives the coins and hands them back to you. 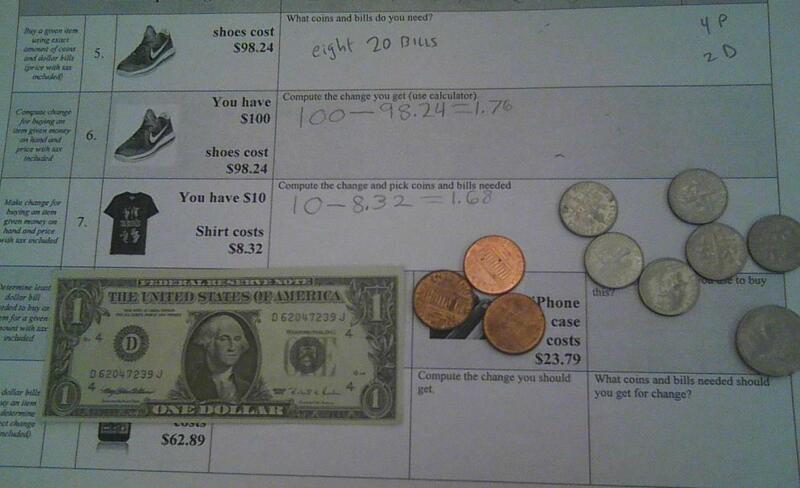 Same scenario but this time provide the student the bills and count out the pennies needed to pay. Choose an item that costs just a few cents, e.g. $2. 08. The student practices counting out bills and pennies. Continue this with just dimes then dimes and pennies etc. At some point you will want to address the concept of change returned by the cashier. To do this have the student pay with a higher bill (5 or 10 dollar bill), receive the change then count out the change at the table. Compare to what is on the receipt (see photo below). For many of our kiddos this process can take a long time because the simple steps like counting out dollar bills takes practice. For example, students often count out money by laying the bills side by side and this takes time. This is not an effective approach to use while standing at the aisle facing the cashier. I was recruited to help a middle school student who is having a very rough time at this time in his life. It was shared with me that he likes Marvel superheroes and he is struggling with counting money and multiplication. Below are some ideas I presented for a test run and photos of the items I ordered for these suggested activities. Get a group of 10 villain cards. Pretend heroes have to travel in groups of 2 and ask how many groups to get 10 heroes to fight the 10 villains. (IGNORE the numbers on the cards). Variations of this. After gets the idea of groupings, focus on the number on the cards and show him two 5s and have him compute. Variations of this. Play a game where he draws two cards and has to multiply the cards (start with very low numbers or maybe show him a 2 card and he has to pick another card to multiply by 2. Tell him he earn money to buy these figures, one at a time – a monetary version of a token economy. Have him rank them by his favorite to least favorite and come up with a price for each with his favorite figures costing more. Start with the least favorite and make the price such that with a little practice he could count out the coins to pay for it. Maybe 17 cents with dimes and pennies. He has to count out the money correctly and independently to actually buy the item. If he needs work with addition you can play WAR in which 3 cards are played and each person adds to find the total. For subtraction do the same with 2 cards. You can play subtraction in which one person has superheroes and the other has villains. In order for a villain to win a villain card has to be higher than a hero card by 3 or more. You can write an 11, 12 and 13 on the J, Q, K cards respectively. All the games can be presented though Direct Instruction – I do, we do, you do. The You do can be used as daily progress monitoring. If he needs prompting this can be recorded. This can be used for your progress reports. Attached is a data sheet I use for activities. Very clever activity implemented by the teacher who runs the Life Skills program at our school. She created envelopes (below) for each teacher. The envelopes do not contain any content but are used for practice sorting mail for the students in the program. The students in the program sort and deliver them to our mailbox. We return them to this return bin for reuse. Such experiences should be available to all of our students who are more severely impacted. Many will need YEARS of practice to develop skills which means a transition program from 18-21 years old may not be enough. Here is an example of what data collection can look like. (The IEP objective should have been indicated on here as well.) It shows the data, any prompting from the teacher (P with a circle around it), notes and at the bottom is 3/9 for 33% correct. Also note that I was working on finding the value of a set of nickels and pennies only before moving onto other combinations of coins and more coins. When I train new math and special education teachers I explain that teaching math should be like feeding a hot dog to a baby in a high chair. Cut up the hot dog into bite-sized pieces. The baby will still consumer the entire hot dog. Same with math. Our students can consume the entire math topic being presented but in smaller chunks. My approach to doing this is through a task analysis. This is very similar to chunking. It is a method to cut up the math into bite-sized pieces just as we would break up a common task for students with special needs. While waiting for my coffee order at a Burger King I saw on the wall a different version of a task analysis. It was a step by step set of directions using photos on how to pour a soft cream ice-cream cone. I thought it was amazing that Burger King can do such a good job training its employees by breaking the task down yet in education we often fall short in terms of breaking a math topic down. Math is often considered an esoteric set of information that is disjointed from the reality people face, aside perhaps from money. Sadly, in school, especially in older grade levels, math is indeed presented this way. A situation as simple as riding an elevator provides opportunities to show and engage a student with math applied in authentic and common situations. For example, the elevator buttons address counting and cardinality (4 indicates a total of 4 floors – ignoring the R), comparison (if we are on floor 2 and need to go down, which floor do we go to?) and measurement (height above ground floor measured in floors). Such situations also provides opportunities for generalization into other settings – the important settings of every day life! Below is a photo of a typical worksheet for money. I worked with a parent of a high school student severely impacted by autism and she explained that her son worked on nothing but worksheets when he worked on math. For students with more severe disabilities the worksheet is not real or meaningful. The photos and the setting is abstract. Below is a photo of shelves in a mock grocery store we set up at our school for students who were in a life skills program. They would have a shopping list, collect the items in a basket then compute the total cost. We had a mock register set up (eventually we procured an actual working register) and the students made the same types of calculations they would on a worksheet but in an authentic setting, which was more concrete. We would start with simple money amounts, e.g. $1.00 then make the prices increasingly more challenging, e.g. $1.73.